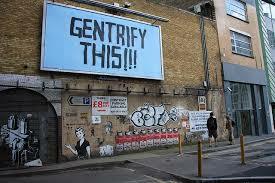 When people think of gentrification, some people won’t know what it may be or what it may refer to. At first, I didn’t really know what it was until after I did some research. The dictionary definition of gentrification states that it is the process or renovating or improving a house or district so that it can be suited for the middle class. In broader terms, a neighborhood is changed in order to attract people from the middle class. This benefits the city or community because impoverished regions begin to look new and buildings or houses are remodeled and renewed. Although this may favor the city and it’s new tenants, the real question is: what will happen to the people who lived in those buildings before? They will most likely be forced to move out because they cannot pay the new rent. This turns into an extremely unfair situation because the people who rented the apartments made an agreement to only pay a certain amount for their residence during a certain amount of time. Once that time is over, owners will most likely raise the rent prices because of the new changes around their community make it more desirable to other types of people. For example, Gentrification mainly favors those that build the new buildings, not those that rented them because their value raises with changes in the community. By renovating a particular house or region, or even bringing big store like Nike, the value of homes and apartments get higher. Recently the house next to mine that had been falling apart for years was bought by an apartment complex firm. In its place, they made some new apartments that made it’s – and the surrounding areas- value go way higher than what it was before. They ended up getting rid of my neighbor that lived there by raising up her rent until she realized that the amount of rent she was paying wasn’t worth the place where she lived so she moved out and that was good for the people who wanted to make the new apartment complex. But this also affects us as the neighbors because before there was a small house and my neighbor didn’t have a car so that meant she didn’t take up parking space outside on the street. But now that there is a new apartment complex where many people can live and many of which may own cars. That will lead to the cars taking up even more space on the street. So this new apartment complex doesn’t benefit us as the community in any way. I just hope that this era of gentrification era happening around us doesn’t affect us in the future. After all, new things come with a big price tag that many cannot afford. Some people don’t make enough money in order to survive. Some people get paid the minimum and are struggling to survive. Yes, gentrification does make the community look better, but, have you ever thought of the people who make up the community and if they are going to be able to withstand the increase in rent?